This entry was posted in News on January 4, 2019 . An art display featuring works from young female artists is set for tomorrow night. 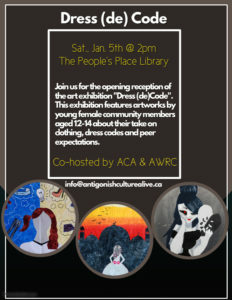 The Dress (de) Code exhibition, co-hosted by the Antigonish Women’s Resource Centre and Antigonish Culture Alive, opens Saturday at the People’s Place Library. Power said they are extremely proud to see the eager young women sign up and come out for the project, noting the artists are pleased with their work. The exhibition reception begins on Saturday at 2 p.m.. The public is welcome to attend. This entry was posted in News on March 8, 2017 . 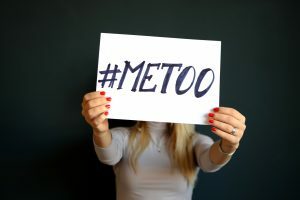 Wednesday is International Women’s Day, and events are planned in Antigonish to celebrate the progress toward equality for women. Events have been happening all week to highlight the importance of women and to achieve equal opportunity in all aspects of their lives. Today, many businesses are stepping up to show appreciation on International Women’s day by offering free coffee and food. A march is also planned for today at noon and will start at the entrance to the Coady Institute. Other events this week include a panel discussion tomorrow night at Dennis Hall and activities on Friday and Saturday.